On Saturday, Grenada became one of the five Caribbean destinations which JetBlue is offering its “Mint” Premium Service from New York. The GTA had a special meet and greet for all arriving passengers on the flight. “There is no better way to start a visit here that with festival steel pan music and tasty local beverages,” said Maher, who confirmed that the 16 Mint passengers also received a special spice gift basket. According to the airline, Mint travelers to Grenada enjoy the longest fully-flat bed in the US domestic premium market, including 4 private suites, and a 15-inch flat screen with complimentary entertainment options. “Customers also enjoy a signature cocktail, a tapas-style menu, fresh espresso from the first purpose-built cappuccino machine for a US airline, amenity kits by Birchbox, and dessert from Blue Marble and Mah-ze-Dahr Bakery,” said a news release from the airline. Maher said that the Mint Winter Seasonal Schedule between New York and Grenada will be only on Saturdays between 21 January and 29 April 2017. 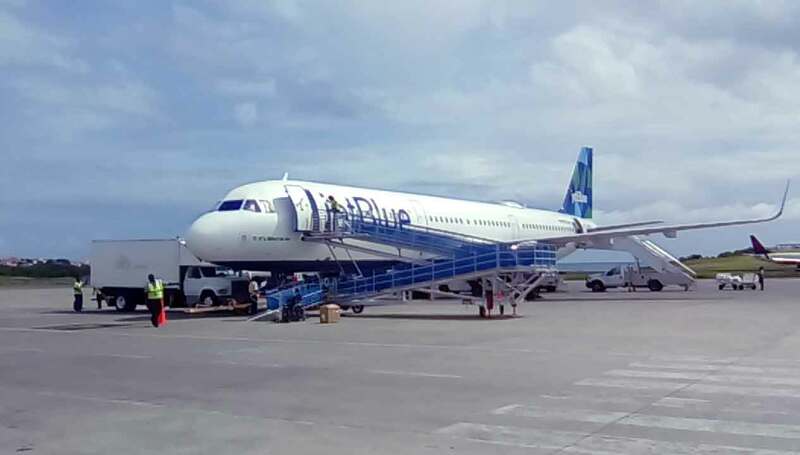 “This means we now have 5 Jetblue flights per week and this is definitely positively affecting our luxury properties especially Sandals and Spice Island Beach Resort,” she said, while confirming that at present there are ongoing discussions to increase JetBlue’s landing at Maurice Bishop International Airport, to daily service. Launched in 2014 on transcontinental flights, JetBlue said that the Mint Service outperformed financial expectations, and stimulated a new market for premium travel. With the introduction of Mint to the Caribbean last year, JetBlue quickly realized that leisure customers visiting some of the top destinations in the region were also craving a higher level of service.